Not many people will remember Rashad Jennings from his days in the NFL as a member of either the Jacksonville Jaguars, Oakland Raiders, or New York Giants. The 6 feet 1 inch (1.85 m) tall, 231 lbs (105 kg) heavy running back will, however, be better recognized from his exploits on reality television. He is known for starring in and becoming only the fourth NFL player to win the Dancing with the Stars dance competition. Read on to find out more about his career and love life. On the 26th of March, 1985, Rashad Andre Jennings was born to Deborah and Albert Jennings in Forest, Virginia, United States. Almost nothing is known about his childhood and family history, aside from the facts that he was raised by his parents in his hometown and is African American. While growing up, Jennings was the chubby kid with asthma who also wore glasses; he also did not show any signs of having the athletic ability that would one day see him make it as a professional. At Jefferson Forest High School, the young boy was a part of his school’s football team, however, he was a fifth-string running back, which meant that he was only able to play his first game for the school in the last game of his junior year when every other player was injured. As things would pan out, Rashad Jennings was able to score a 30-yard touchdown on his first handoff in the game. He later scored a 40-yard rushing touchdown and 2 more touchdowns on defense, which caught everybody by surprise. A scout in the stands who came to see another player reportedly approached him and encouraged him to get his grades up in order to get a scholarship. Following that pat on the back, Jennings transferred to Lynchburg Christian Academy (LCA) to repeat his junior year as he also began to work on his body. In his junior and senior year at LCA, he recorded 3,287 yards and 56 touchdowns to earn two All-VISAA Division II selections as he also lettered in basketball. 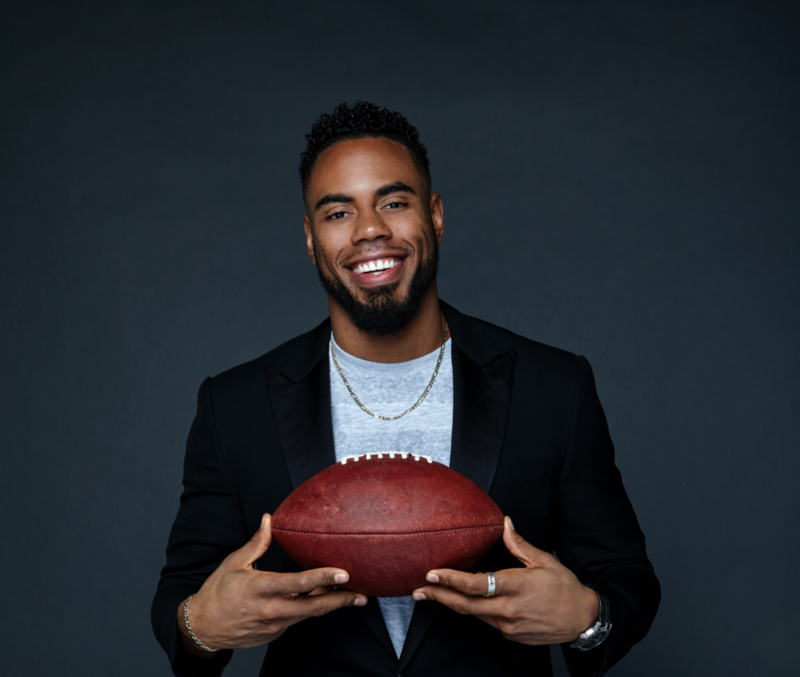 Rashad Jennings went on to play college football at the University of Pittsburgh and Liberty University before making it as a professional after he was drafted 250th overall in the seventh round of the 2009 NFL Draft by the Jacksonville Jaguars. He had a promising rookie season in the big leagues, however, injuries hampered him being able to fulfill his potential; so by 2013, he joined the Oakland Raiders to have a fresh start. He spent only a year with the Raiders where he showed enough quality to earn himself a four-year contract with the New York Giants in 2014. For the first time in his career, the Virginia native became a starter and went on to play for three years before retiring in December 2017. As has been the case with every other celebrity that looks appealing to the eye, everyone wants to know the juicy details of their love life and relationship history, as it always seems to contain mouthwatering gist. But unfortunately, Rashad Jennings is not your everyday celebrity who has dated a hundred and one ladies and has every detail about himself in the public. For as much as we can tell, the former athlete is not married and is currently single. On Valentine’s Day 2018, he was pictured out and about in Times Square, New York handing out roses to different people, a clear sign that he had no commitments to anyone on that day. Jennings’ last notable relationship was with his longtime girlfriend whose identity is unknown. In an interview in 2017, he revealed that he and his former girlfriend, who he had proposed to, mutually called it quits in 2014 after having gone through each other’s growing stages and phases but were on different pages in regards to their ambitions. Since that time, Jennings has focused on other endeavors and according to him, hasn’t paid much attention to starting another relationship, even though he does plan to get married someday. The Season 24 of Dancing with the Stars winner further revealed that his ideal lady is an everyday girl who is funny and family oriented among other things. He also added that she must also get along with his mother.